Busy week for Norway’s new “Marjata” intelligence gathering ship. Russia closes areas in Barents and White Seas for multiple comprehensive naval drills. The Russian Northern fleet has few vessels at port this week. Artillery shootings and cruise missile launches are officially announces by the Defence Ministry in Moscow. A possible Bulava ballistic missile launch could also be in pipe for later this week. Port administration for northwestern Russia has issued several navigation restrictions for civilian vessels. A large area in the eastern Barents Sea, west of the southern island of Novaya Zemlya is closed of from September 30 till October 1st. “Sailing is prohibited. Shootings with missiles and artillery,” the warning reads. Sailing PROHIBITED in the waters west of Novaya Zemlya in the eastern Barents Sea. 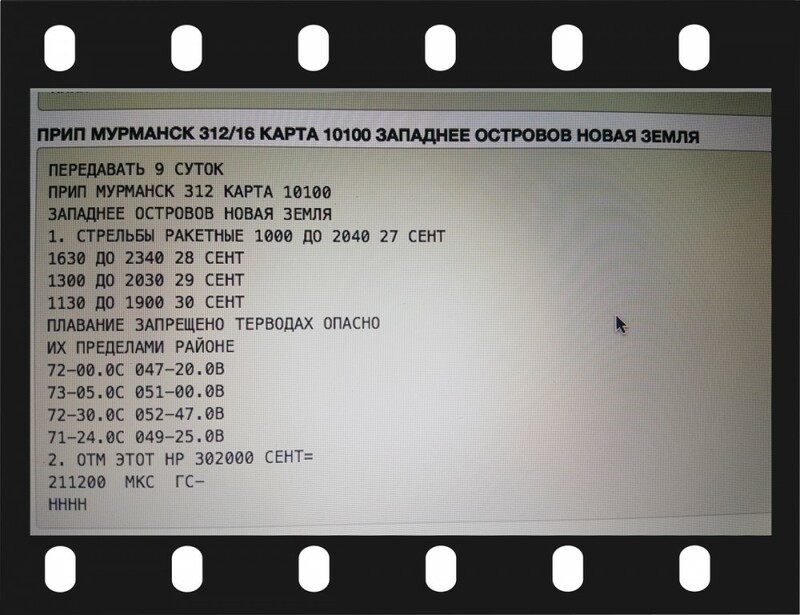 Screenshot of navigation warning issued by Russian port authorities. 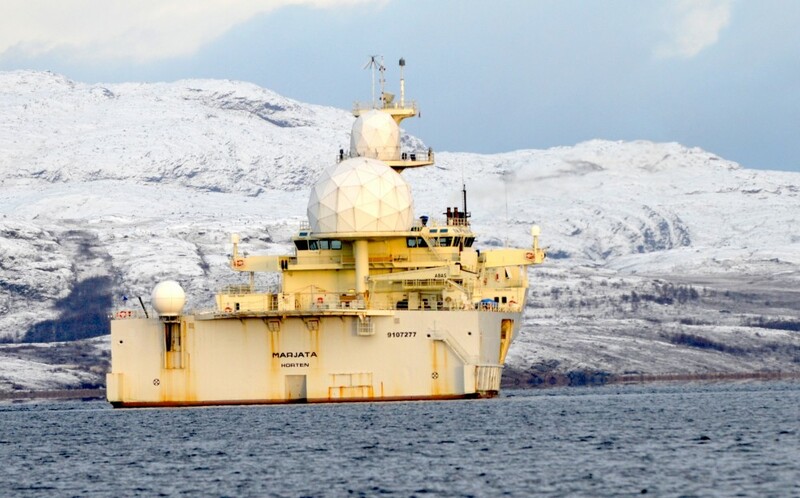 Chief of Norwegian Intelligence Service, Lieutenant General Morten Haga Lunde confirms in an interview with Aftenposten on Monday Norway’s increased surveillance in the Barents Sea following a sharp raise in Russia’s military activities in northern waters. “Marjata” is currently sailing the eastern Barents Sea, while the old “Marjata” – today named “Eger” - sails the western Barents Sea and the Norwegian Sea. “Eger” has Harstad as homeport while the new “Marjata” sails out from Kirkenes. Another published Russian warning concerns an area close to Novaya Zemlya further north. The area was closed on Monday and will not be open for civilian navigation again until September 30. Missiles will also be launched in a third area in the eastern Barents Sea during the week. Russia’s Defence Ministry says the Northern fleet’s nuclear-powered battle cruiser “Pyotr Velikiy” and an Oscar-II class submarine are practicing combat shootings with cruise missiles. The submarine fired at least one Granit cruise missile from submerged position in the Barents Sea. More than 12 warships, among them the destroyer “Admiral Ushakov” and 10 support vessels participate, in addition to military aircrafts and Air Defence systems, the Defence Ministry note reads. Also on Monday, about 10 warships sailed out from the naval base Belomorsk in Severodvinsk by the White Sea, another note from Defence Ministry says. The vessels will drill anti-submarine warfare aimed at eliminating a simulated enemy submarine by performing torpedo and artillery firing. The flotilla will additionally drill communication, manoeuvring and ship-damage control. The Barents Observer could Monday see photos posted on Russian social media of the Northern fleet’s only Borei-class submarine “Yury Dolgoruky” sailing out from Severodvinsk. The attached texts indicated the images were from Sunday morning. Sailing north through the White Sea and Barents Sea, “Yury Dolgoruky” could be in the area west of Novaya Zemlya closed off for civilian navigation by Tuesday. If so, the submarine might launch the first Bulava ballistic missile since November last year. Russia’s ongoing serial drills at sea follows last week’s joint naval drill in the waters near the New Siberian Islands where vessels from both the Northern fleet and Pacific fleet participated. Among them the Severomorsk based anti-submarine warship “Vice-Admiral Kulakov”. Last Thursday, two Tu-160 strategic bombers were on a long flight-mission around the Barents Sea, Norwegian Sea, North Sea and further south to Spain before they turned and flew northbound again. The Tu-160s can carry cruise missiles with nuclear weapons.